"If you are not familiar with banana squash, this is a great 'first-timer' recipe to try. 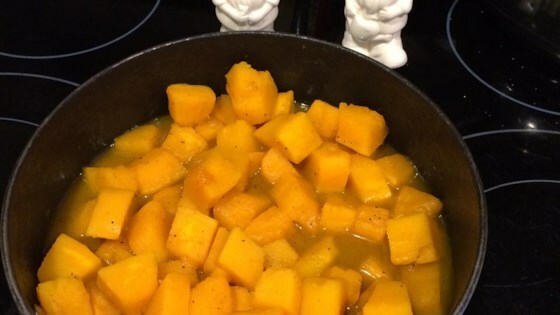 Cubed squash is simmered, then glazed in a simple citrus sauce. It is basically foolproof and everyone will love it! Even my kids ate it up. This serves well with chicken, pork and fish." Melt butter in a large skillet over medium heat. Add squash cubes and water. Cover, and cook for about 5 minutes, or until squash is tender. Stir occasionally, and add more water if necessary to prevent squash from sticking to the pan. Reduce heat to low, and stir in the orange juice, apricot preserves, cloves, salt and pepper. Cook and stir uncovered until squash is evenly glazed. yummie yummie for the tummie I don't know of anybody that would not like this - I was given a hugh banana squash, had never cooked one, and found this recipe, instant success. This recipe was very easy and tasty. I admit I was expecting/fearing it would be very sweet, but it was perfect - a nice blend of sweet and savory. I didn't have cloves, but it came out fine. This has excellent flavor. A great fall side dish that is really good served with rice and fried chicken. My kids thought they didn't like squash until they tasted this. So good, so easy. great taste. Very easy to cook, even for a beginner like me. Squash did take longer to cook than the 5 minutes. Maybe my cubes were too big.. SO GOOD! I will definitely be making this again.